Ok so a part of me is kind of over nail art, it’s fiddly, time consuming, then your nails are likely to smudge straight away and all your hard work is ruined – well in my case anyway. Attempting nail art with a toddler is pretty much impossible, even if they’re in bed you’ll know they’ll wake up wanting a wee just as your highly delicate detail has been applied! 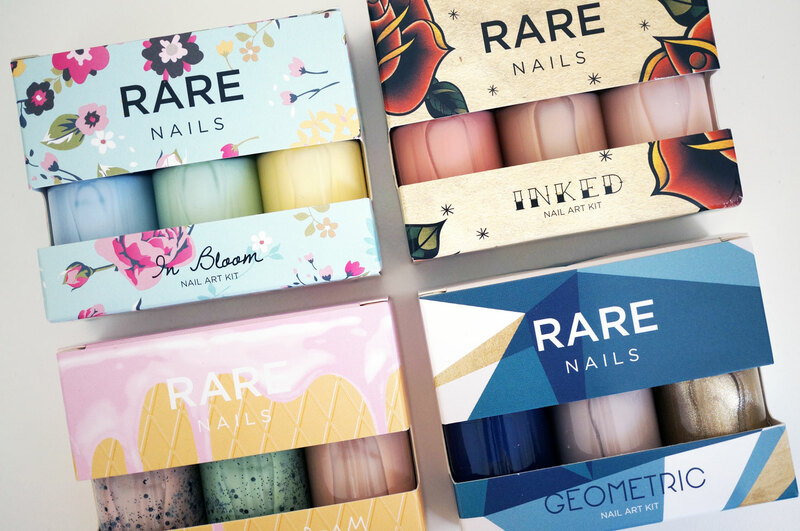 So, for someone that finds nail art a bit of a faff, I was delighted when I heard about Rare Nails, who offer some fabulous and easy to use nail art transfer sets. To be honest with you, I’ve never actually tried out nail transfer stickers, but now I’ve had the pleasure of using Rare Nails’ sets, I’m really impressed with the speed and ease of use. The Nail Art Sets each contain three polishes that go together, whether they’re matching or contrasting, and each set follows a theme so the polishes can be mixed and matched. Also each set contains it’s own set of nail transfers and instructions. The first thing that impressed me about this collection is the size of it, there are 24 sets to choose from, wow! Ranging from aztec, to disco to animal print and polka dots, there really is something for everyone! 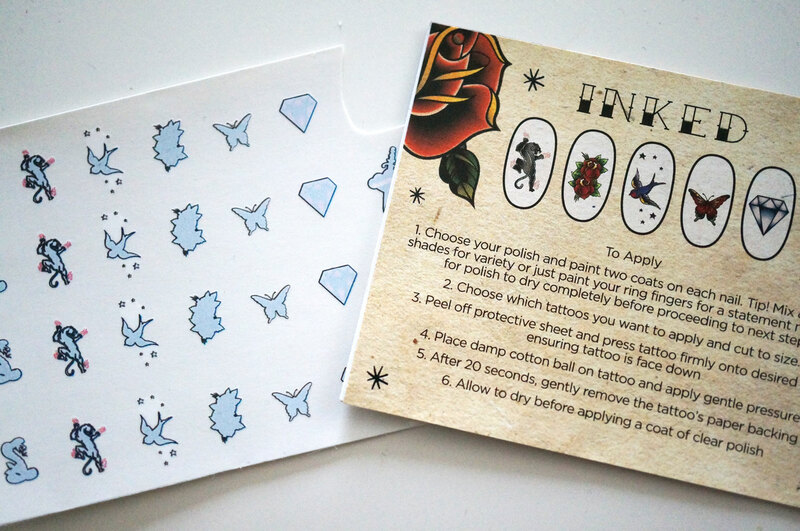 I was happy to find out that the transfers are just like the temporary tattoo ones you used as a kid, where you press them on then cover for 20 seconds with a damp tissue or damp cotton wool, and the image is miraculously transferred onto the nail – easy peasy. Tattoo and In Bloom were easily my favourite sets, you just cut out the transfer you want and off you go. 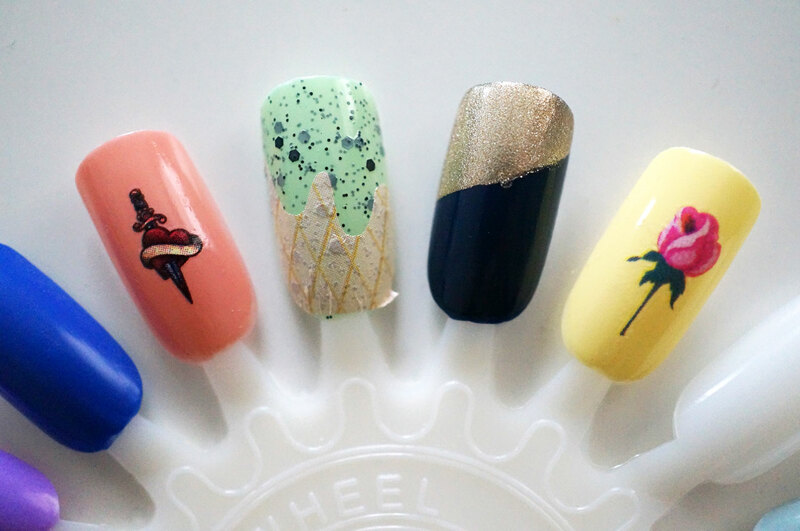 Ice Cream, though a great idea was a bit more fiddly, you’re given one large transfer sheet so you can cut out whichever shapes you like, so you have to guess the width of your nail if you’re going for an ice cream cone look. Also the transfer was a bit on the sheer side so you can still see the polish through. The Geometric set included a page of sticky strips which you just stick on your painted nails once dry, then paint over to create geometric shapes – you can see I managed to smudge this one! I’m sure this would work really well with practice though. FYI you’re also meant to finish and ‘seal’ them with a clear top coat, this will help the transfer stay put and make your mani last longer, as well as going a lovely gloss finish. I should also mention the quality of the nail polishes. I found the lighter colours were quite sheer, but came out fully opaque with two coats, and the darker colours were excellent and only needed one coat. I was really impressed with the formula! Overall I think these sets are a fantastic idea, and really good value for money. The polishes and transfers both get a big thumbs up from me! 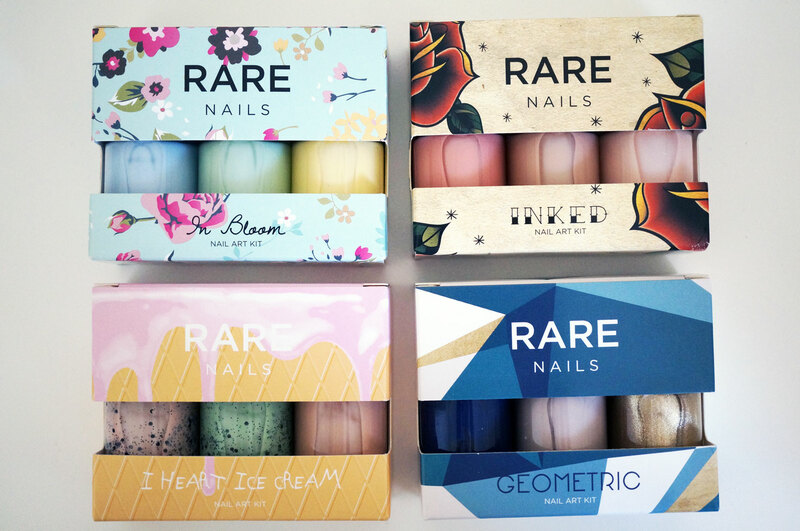 Rare Nails Nail Art Kits are available from Amazon for £11.95 each. Previous Post Introducing Versace Eros Pour Femme EDP + Giveaway! I’m another that doesn’t have much patience with nail polish, so easy to chip even when careful, but I can’t resist the pretty colours. These selections look really good. I have recently been growing my nails and for once in my life they are in good shape! Oh these are so sweet! I need to get my nails into a much better state!! Great idea, and so pretty. My nails have suddenly taken a nose dive and looking horrid. I need these in my life, with three boys my nails are a mess! I love the in bloom kit. so pretty!